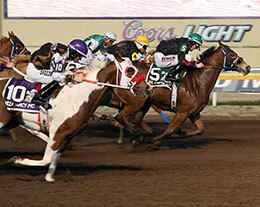 First-crop sire Wagon Tales got first APHA stakes winner on Saturday at Remington Park. OKLAHOMA CITY, OK—MARCH 23, 2019—First-crop Quarter Horse sire Wagon Tales got his first APHA stakes winner on Saturday when Dtl Chasin Tale won the $162,028 Oklahoma Paint and Appaloosa Horse Futurity(G1) at Remington Park. Racing for DTL Teel Partnership, Dtl Chasin Tale completed the 300 yards in :15.630 with a 6 mph tailwind to take home the winner's purse worth $62,880. Trainer Matt Whitekiller conditions the colt out of SF Royal Quick Flash mare Shez Showin Off. Dean and Tonya Lester is the breeder. 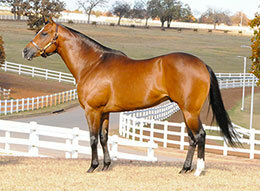 A son of leading sire Pyc Paint Your Wagon, Wagon Tales won or placed in 10 of 15 starts and earned $427,579. He won the Remington Park Juvenile Invitational, A Ransom Handicap and was third in the Grade 1 All American Futurity, Grade 1 Heritage Place Futurity and Grade 1 Leo Stakes. Out of the Shazoom mare Signs Zoomer, Wagon Tales is a brother to AQHA Racing Champion The Fiscal Cliff ($580,425) and half-brother to stakes-placed The Polar Vortex ($61,308). The second dam Stylish Sign by Vital Sign, is the dam of Champion of Champions(G1) winner Mr Pyc To You ($478,045), Speedhorse Futurity(RG1) winner First Painted Sign ($284,911), stakes winner and stakes sire Second Painted Sign ($101,604), etc. This is the immediate family of Ruidoso Futurity(G1) winner First Valiant Sign ($1,053,184), Remington Park Oklahoma Bred Derby(RG3) winner A Tres Of Paint ($509,84) and Hobbs America Derby(G3) winner Apollitical Sign ($138,173), etc. Wagon Tales stands for a 2019 fee of $1,500 at Lazy E Ranch near Guthrie, Oklahoma. For additional information or breeding contracts call Butch Wise or Matt Witman at (405) 282-3437.